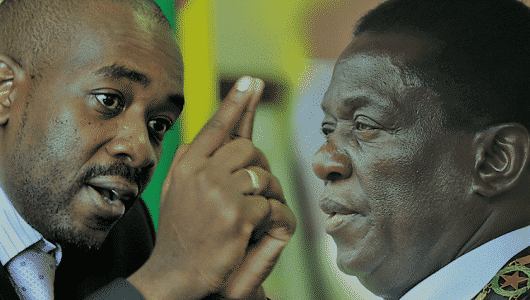 Opposition MDC President, Nelson Chamisa has once again snubbed a dialogue meeting called at the State House today maintaining that the venue for dialogue and the convener of the meeting were compromised. In his bid to bring closure to the July 2018 election dispute, President Emmerson Mnangagwa called for a dialogue meeting at his state residence on the eve of his departure for the African Union Summit in Addis Ababa, Ethiopia. MDC spokesperson Jacob Mafume told 263Chat that dialogue that excludes his party boss is just but a monologue charging that President Mnangagwa will be speaking on his own. “We have described it as a monologue. It’s not a dialogue. That is a monologue where the President will be speaking about himself to himself with himself. “We received the initial invitation and we replied saying we are not coming until principles of a dialogue are established. We have a dispute between them and us. So that dispute cannot be mediated by ourselves just like at home or anywhere else that people have a dispute they cannot self-mediate. “Self-mediation has failed. So we need a mediator; an independent mediator and a platform where present issues that are affecting the people of Zimbabwe to be discussed. The problem of Zimbabwe is not us speaking and talking about ourselves as politicians. We have an economic and social crisis that’s occurring that need to be solved,” Mafume said. 263Chat further learnt that the dialogue meeting at State House did not go smoothly as one opposition leader Daniel Shumba walked out while Alliance for People’s Agenda (APA) leader Nkosana Moyo was restrained from leaving. “I told them that I cannot be part of nonsense and I walked yes,” said Shumba. “Mnangagwa was not there yet he is the one who invited us and he delegated some guy (Nare) and he was out of his depth. He does not know the difference between a moderator and a chairman. In our initial meeting, we raised a lot of pertinent issues and we could not proceed without Mnangagwa responding to those issues,” he added. Build Zimbabwe Alliance (BZA) President Dr Noah Manyika also joined Chamisa in dodging the dialogue meeting citing the same reasons as raised by Shumba and Chamisa. Information, Media and Broadcasting Services Minister Monica Mutsvangwa could not be drawn to comment as she said she was in a meeting.